Establishing a small business is the most rewarding – and challenging – career move you could make. But the freedom of being your own boss comes with a number of trade-offs, including mountains of admin, more responsibility, and a lot more to lose – especially in the early years. Small & Medium Businesses represent 40% of all South African businesses and will account for 90% of all new jobs by 2030. Clearly, small businesses have a crucial role to play in economic development and job creation. Yet 70% to 80% of small businesses in South Africa fail within the first five years, for reasons including funding constraints, not having a clear business plan, and poor inventory and cash flow management. 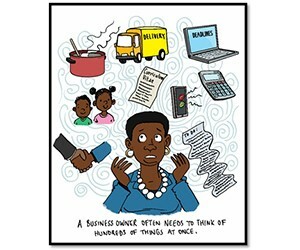 Many entrepreneurs are caught off guard by the demands of running a business. Often, they don’t realise that they need to be a jack of all trades – at least in the beginning – until they can scale to a point where they can hire more people or outsource certain business functions. If you’re looking to start your own business, know that, initially, entrepreneurship is demanding of your time and relentless on your skills and resources. Build a safety net: Before you start your new business venture, build up your savings to carry you through the first tough months and to cover any unexpected expenses. The last thing you want is to be racking up bank debt in the first few months of operation. Be frugal: Work from home or from shared office spaces to save on rent and other operating costs. Benefits of shared working spaces include fast connectivity, opportunities to bounce ideas off of other entrepreneurs, professional looking meeting rooms, and coffee on tap – you’ll need all the caffeine you can get in those early months. Keep a tight hold on the purse strings and only spend money on equipment, team members, and supplies if absolutely necessary. Keep an eye on your numbers: Cash flow management is arguably the most important consideration for any new business owner. Having sight of exactly what is coming into and what is leaving your business account will help to identify where you can streamline operations and save money. Conduct a break-even analysis – a calculation of the sales targets you would need to meet to cover fixed and variable costs – and identify areas where you can cut costs. Automate as much as possible: You’re not only a new business owner. You’re an accountant, a marketer, a strategist, HR manager and an administrator. That’s a lot to have on one plate. Solutions from companies like Sage automate many of the HR, accounting and administrative tasks, freeing up your time to focus on more important things, like strategy and marketing. Choose a solution that is easy and intuitive to use, and also gives you insights into how your business is performing at a glance. It’s hard work building an empire. But if you gear all these administrative and financial tasks towards delivering the best product or service you can, and matching that with excellent customer service, then you already have a firm foundation. *Sage is the official sponsor of the Small Business Awards with 702 and Cape Talk, which recognises and rewards small business excellence. Visit http://www.sba.702.co.za/ or http://www.sba.capetalk.co.za/ for more information.